Home › Home and Kitchen › Hudson Essentials Deluxe Salt And Pepper Grinder Set - Ceramic Blade & Stainl..
Hudson Essentials Deluxe Salt And Pepper Grinder Set - Ceramic Blade & Stainl.. 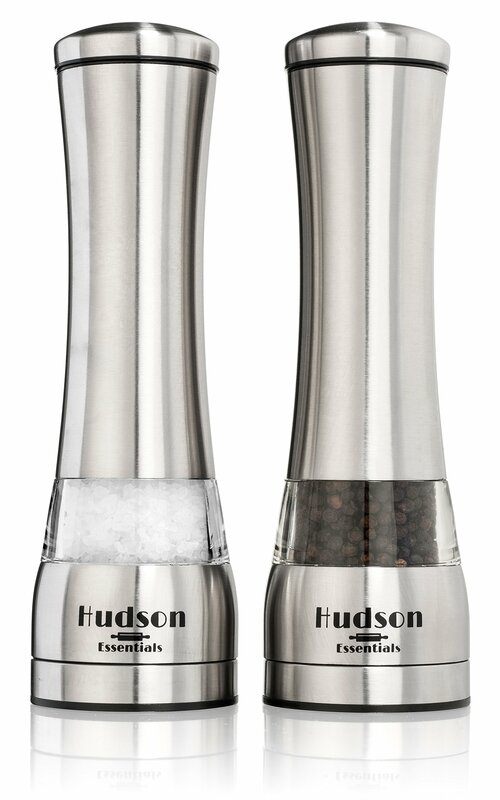 The Hudson Salt or Pepper Spice Grinder is universally designed to work as aspice grinder, a pepper grinder or a salt grinder with equal ease. The millgrinder has an extra wide opening to allow for no-spill filling in seconds,and the stainless steel housing is easy to re-assemble. An adjustable ceramicgrinding mill mechanism gives you the flexibility to choose a coarse or finegrind level in seconds, and you won't believe how easy it is to give thispepper mill a twist to grind.